Christians have gone and lost their minds this election season. Do not get me wrong, they usually do, but this time it is simply over the top. For decades now, Christians have sold themselves and God out to the Republican Party in this country. It did not matter who the candidate was, they were anointed as "God's choice" to defeat the godless Democrat, whoever they were. In 2000 it was a man who thought Jesus was a philosopher. In 2004 we were against the man with the Purple Heart, Bronze Star and Silver Star and allowed him and his service to be unmercifully maligned while we waved the flag and double downed on George W. Bush. The same Bush who would admit in an outgoing interview that he believes all religions serve the same god. Lucy teed the football up for us again in 2008 as we sided with a man who as part of the Keating Five, cost this country 160 billion dollars in the Savings and Loan crisis. To top that off, he chose as his running mate someone so uniquely unqualified for the job that it should have demanded that we do not cast our vote for their ticket. But cast it we did. In 2012, we pretended that the choice of God was a member of a satanic cult! That's right; Mitt Romney the Mormon was also no ordinary Mormon. He was a direct descendent of one of the 12 founding apostles of Mormonism and tithed 25% of his enormous wealth to the Mormon Church. The Billy Graham organization even removed Mormonism from their list of cults six months before the election. Even God must have been shaking His head at what we would be willing to compromise for our own petty politics while pretending it is all for Him. A war mongering fake Christian, Sarah Palin, and a Mormon. That sounds like the start of a really bad joke but we have saved the punch line for this year -- Donald Trump. Let me first state that this is not an endorsement of Hillary Clinton. Usually what we have seen so far this election season is that whenever someone has the temerity to point out how unbelievably unqualified Donald Trump is the response is focused on Hillary. That is not only nonsense but it is intellectually vacuous. If you hate Hillary that is fine but it does not make Donald Trump one iota more palatable as President of the United States. It certainly does not make him "God's choice." That is really more to this point. No one pretends that Hillary Clinton is God's choice. No one tries to find biblical defenses of why Christians should vote for Hillary Clinton. Yet that is what we constantly see on the other side. I saw recently a blog from a respected evangelical suggesting that Trump was the moral choice. You have got to be kidding me. This is a man who in one campaign has already attacked Mexicans as rapists, mocked a woman's ovulation, mocked a reporter with a disability, questioned the integrity of a judge who was born in Indiana because of his Mexican heritage, and creates disparaging nicknames for anyone who stands in his path. Lying Ted, crooked Hillary, Pocahontas, little Marco, little Mike, low energy Jeb, crazy Megyn, loser John McCain, Crazy Bernie, and goofy Elizabeth Warren to name but a few. There is nothing moral about Donald Trump. Just this week he attacked a Gold Star Mother who lost her only son in war. Yet the compromised Christo-republicans have excuses for everything he says and does. Let me also say that they very well may have reasoned in their own mind that this is somehow justified. The anti-Hillary sentiment is very strong. Yet what gets lost in the lesser of two evils argument is that one still must defend and support evil. You cannot make a cogent Scriptural argument for supporting evil. The Bible makes it very plain that accursed is he who calls evil good. I think the lesser of two evils is a secular perspective that we confuse as a Christian mandate. The truth is we have absolutely zero Christian responsibility to vote for the next king of Sodom. Those Christians that think otherwise have been influenced by some very popular heresies. One is known as the New Apostolic Reformation and the other is the known as the Seven Mountains Mandate. These are not new false teachings. They are just modern versions of an old heresy known as Dominionism. This is the belief that we need to prepare this world for the second coming of Jesus Christ by influencing and in fact taking over, the culture. That Jesus cannot actually come back until we do. Some of the seven mountains for example are government, media, and entertainment. This is why you see so many in the Christian world giddy with the recent spate of pseudo-Christian movies. They think this means they are advancing on that mountain. Never mind that the movies are generally contrary to the Bible. From the government standpoint, the dream has always been to get a president who shares our faith but that is simply a pipe dream in the pagan nation of America. No matter how much we pretend this was once a Christian nation, anyone with a rudimentary understanding of history knows this to be inaccurate. The cold hard reality today beloved is that this country and world are akin to the Titanic and we have already struck the iceberg. If you have read the books or seen the movie, you know the ship is going down. It does not matter who the captain is. It does not matter how we rearrange the deck chairs. The only thing that matters is pointing people to the lifeboats while there is still time. While Christians squabble over two candidates that are both at odds with our faith the Gospel is not preached and is in fact damaged. I have seen Christian after Christian tweet and repost absolute lies in support of Trump or in tearing down Clinton. Why in the world would anyone listen to you regarding the truth about Jesus if they see you care so little about the truth when it comes to politics? As believers we should never be found on the wrong side of the truth. Never. To me they cry, "My God, we -- Israel -- know you." Israel has spurned the good; the enemy shall pursue him. The church has indeed promised itself plenty, peace and victory through the idolization of this country. They thought it would come with Bush, then McCain, then Romney and now of all people Donald Trump. But like with Bush, McCain and Romney before, Trump will also lead to unfulfilled expectations. Elected or otherwise. The answer is never found in any man or woman but only in Christ Jesus. Beloved the works of darkness are unfruitful. Pretending that there is a shred of righteousness in Donald Trump will not change that fact. It is nothing short of pure folly to be seeking any form of satisfaction in the creature rather than the Creator. It is a great sin to corrupt the worship of God! It does not matter what our excuses might be. Our defenses will be like clay pottery before our Maker. God Himself has cared enough to write His law for our benefit yet we casually toss it aside in our pursuit of carnal wealth and earthly purpose. We build churches. Great edifices to rival the Tower of Babel. We do so to provide the veneer that we care about God and what He wants but our actions reveal that we have truly forgotten Him. Beloved, only services that are done according to His Word and through Jesus Christ are acceptable to God. I understand that we must live in this world but the Bible says our citizenship is in heaven, not America. That means our first and foremost concern has to be for the things of God in relation to the Gospel, not this world. This does not mean you should or should not vote for any candidate. It means we need to stop calling what is clearly evil, good. It means we have to stop rallying around the lesser evil as if that imputes some righteousness to it. It means we are always found on the right side of the truth and we do not compromise the Gospel of Jesus Christ for personal, carnal politics. 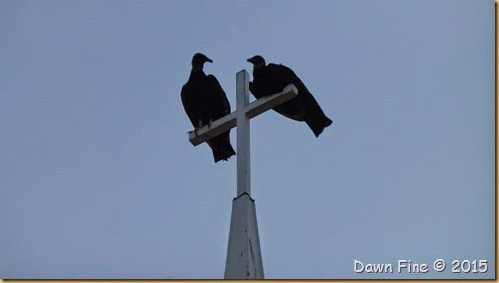 It means we take a long and serious look at that vulture hanging over the carcass of the church. The trumpet is indeed sounding. The ship is starting to go down. Will we be found arguing over seating arrangements or directing people to the lifeboats?